When it comes to trimming and men’s grooming, Remington is one of the most reputed names in the world. The company owns the distinction of making the world’s first electric shaver for men and hence expectations are sky-high from it whenever it launches any new product. The PG350 Creative All in One Creative Kit, one of the excellent products from Remington’s stables, doesn’t disappoint its users. This can be used as a grooming kit for your beard, goatee, sideburns, or mustache. Read through our review of the beard, nose, goatee, and hair trimming kit. Can be used as corded/cordless models, which gives you a great deal of flexibility, and you won’t run out of juice part of the way through shaving. 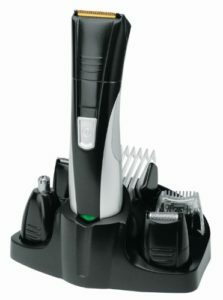 Other reviewers have found the trimmer doesn’t give an even shave with the trimmers in. This trimmer comes in towards the bottom of the ratings at currently 3.6 out of 5 stars. It only has 64% of the ratings at 4 stars or higher. It does have a lot of accessories in the kit, but there are better trimmers and kits out there. Take a look at our top ten beard trimmers. We also have many reviews on other trimmer kits, if you want a full kit. For £20 maybe you aren’t looking to spend much more than this, but for a little more you can find a higher quality kit. Try taking a look at BaByliss for Men 7420U Super Groomer Review, for a complete kit at just a little higher price point with much better overall reviews.